In the December quarter, Apple's iPhone captured 20.9 percent of the smartphone market, up from 13.9 percent in June. It was the launch of the iPhone 5 that caused Google's fast growing Android to reverse and actually lose market share at the end of 2012. That led analyst Charlie Wolf of Needham & Company to ask on Monday why smartphone market shares can collapse with "such brutal speed." 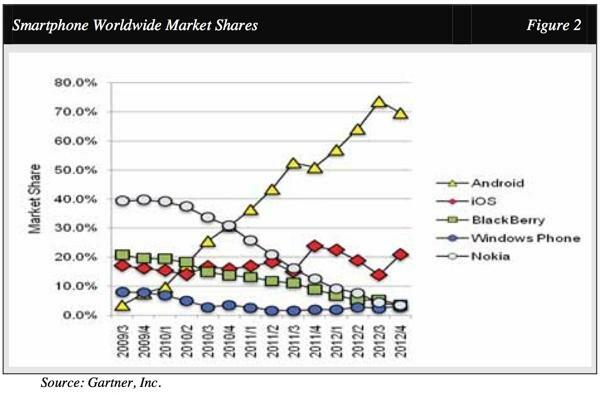 While Android has grown and dominated platform market share, only Apple has been able to hold its 20 percent share. Meanwhile, previously dominant platforms like BlackBerry, Nokia's Symbian and Microsoft's Windows Phone have become minor players. The most important reason for these changes, Wolf believes, is the fact that carriers have "exceptional influence" on the phones customers buy. He said this strategy has worked particularly well for Android, because Google offers carriers and their retail staff incentives to push the brand. "If the carrier decides to punish or simply ignore a brand, it can rapidly die, as we've seen in the case of BlackBerry and Nokia," Wolf wrote. Another key factor in a sometimes chaotic market is the fact that many smartphone users replace their handset every year or two years. In comparison, PC owners typically keep their investment for four years, while TV sets last seven years or longer. In addition to more opportunities for customers to switch brands, those brands are not "protected" when they are sold in carrier stores, where all products are essentially sold side by side. The only major vendor that has a means to prevent this is Apple, which sells iPhones through its own retail stores.